Can you guess which one is for this blog? Well, it seems that I should ask my students to tone it down a bit to make their blog more readable… According to this test, they write at a higher level than I do. I guess I could just take the credit for that ;-), but I think something else is going on here. 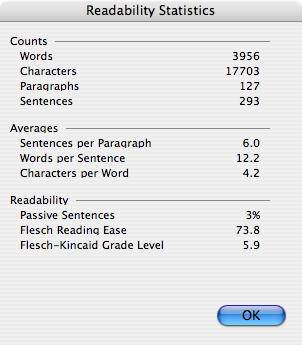 So I fired up MS Word and decided to test out the readability stats of both blogs using the tools there. Word will test your document for Flesch Reading Ease, and give it a Flesch-Kincaid Grade level. This was written by Stephen Henneberry. Posted on Friday, November 16, 2007, at 4:22 pm. Filed under Blogging, Webtools. Bookmark the permalink. Follow comments here with the RSS feed. Both comments and trackbacks are currently closed. Just tried out Blog readability test on my blog and it says the level is genius. If that were true I wouldn’t be able to read it myself. I think your idea about kanji may be the key. I sometimes provide glosses on my blog. So, there is some kanji. What a surprise ending up at this site, Steve! Didn’t expect this at all! And a holiday greeting seems really inappropriate, but it’s better than no where! Hope you and your family are doing well. Are you all gathered in Japan or did you come back to the States? I want to wish you a Merry Christmas and Happy New Year. May it be a wonderful new turn around the sun. We really have to find a way to get together soon. Talk to you soon, Steve. Enjoy your holiday abroad and lets meet up when you are back in Japan again.